An ultra-compact version of the MPX, Sig Sauer’s Copperhead variant is legally a pistol and is new for 2019. Featuring a 3.5-inch barrel with an integrated muzzle brake, the 4.5-pound Copperhead comes from the factory with a two-position pivoting brace that Sig advertises as contouring and adapting to the movement of the shooter’s arm. Finished in FDE Cerakote E190, the pistol runs 14.5-inches overall with a top-mounted M1913 rail. “The MPX Copperhead considerably reduces the length, width, and size of the MPX platform making it the most compact addition to the MPX family of firearms,” said Tom Taylor, Sig’s Chief Marketing Officer and Executive VP for Commercial Sales. Using a short-stroke gas piston action, the Copperhead MPX is chambered in 9mm and ships with a single 20-round magazine. 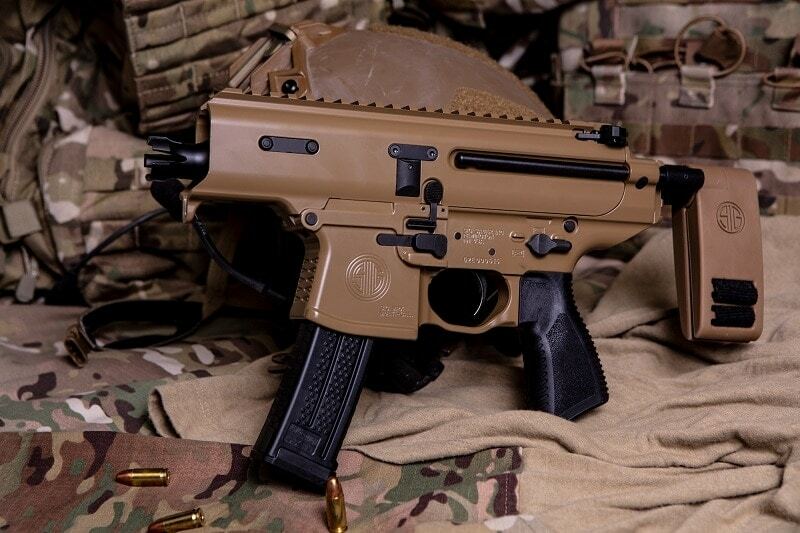 As Sig submitted a variant of their MPX series to the Army for the military’s request to field a new Sub Compact Weapon for use with personal security detachments last year, it is likely a safe bet that the Copperhead stemmed from the same train of thought, but as it is semi-auto and uses a brace, is primed for the commercial market. While the company did not say as much, the header image for the new pistol, shown below, is complete with the Army’s OCP pattern camo. The post Sig releases new 9mm MPX Copperhead braced pistol (VIDEO) appeared first on Guns.com. What Exactly is Project Childsafe?